Elias Chabtini is the founder and CEO of Medica Group, launched in 1998. With 20 years of experience in the medico-aesthetic industry, Medica Group caters to dermatologists, plastic surgeons, aesthetic centers and spas around the world. Having started out his career by selling the first hair removal treatment laser in Lebanon for $250,000, Elias soon began to reimagine noninvasive cosmetic surgery with the vision and focus to becoming a leader and pioneer in the industry. With Elias’s dynamic entrepreneurial outlook, Medica Group shifted from being a regular distributor to a beauty solutions consultancy for its partners and clients. Over the past two decades, Medica Group has established itself across 18 markets with over 200 colleagues. Today, Medica Group stands as a key partner to various suppliers and manufacturers in the medico-aesthetic industry. Medica Group supplies its first-rate service and technology-driven solutions to all its clients. Having partnered with the most prestigious and renowned global vendors, Medica Group is regarded as the first choice for regional aesthetic practitioners as well. 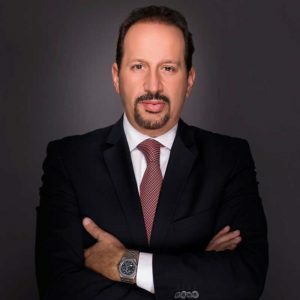 With Elias’s business acumen and a keen eye for successful trends, Medica Group’s growing presence spans multiple markets across the GCC, Levant, North Africa and South East Asia. Going by the maxim “looking good is not an option anymore, it’s a way of living,” Elias has lead the way to bring innovations to the regional markets. Elias Chabtini believes in extending his insights and experience and offers training and educational programs to the next generation of entrepreneurs. He was also recently featured in the top 100 inspiring leaders in the Middle East by Arabian Business. Today, as an active board member of multiple investment funds, he seeks to continue the entrepreneurial mindset different business ventures.